Shipping is a relatively new term in our collective repertoire of vocabulary – or is it? The term seems to be exploding everywhere in the media these days, especially in the Star Wars fandom universe. But, what is shipping, how did it become a “thing,” and why do we humans feel the need to partake in such a practice? “To ship” is basically to link two characters together, usually in a romantic way, but this does not always need to be the case. By doing so, we endorse the pairing, thereby saying we put our ‘seal of approval’ on the relationship. Oftentimes, we see the evolution of a new name to label the ship, assigning that new entity a word that blends the once separate souls into one seamless word that rolls off the tongue. Shipping can be seen as a sort of by-product of our own desire to make an emotional investment in a relationship. That investment may not be our own leap of faith, per se, by entering into our own adventure, but we project that desire and investment into a pairing in which we can value. We root for happiness, success, and in many cases, a steamy romance. In real life, we have seen celebrity couples shipped quite a bit. The most famous that come to mind for me are Brangelina (Brad Pitt and Angelina Jolie), and Bennifer (Ben Affleck and Jennifer Garner). Ships can also be friendships, or even worships – like a bromance between two guy pals (Prequel Era Anakin and Obi-Wan immediately come to mind for that example). A worship example would be Kylo Ren and his idolization of Darth Vader. My first a-ha moment to the idea of shipping fictional characters was from watching an episode of The Big Bang Theory, in which Sheldon and Amy’s romantic relationship was renamed “Shamy.” I didn’t know that the practice actually had a specific nomenclature attached to it, I just thought it was cute and endearing. Once the idea of shipping was ingrained into my psyche, I started hearing the term seemingly everywhere (a phenomenon known in psychology as “The Red Car Syndrome”), so I decided to dig a little and find out what this whole shipping fad was all about. After perusing a few resources, I found out some interesting things. The term is said to have been inspired by the word “relationshipping, or “coupling” in Japanese. One of the first couples to officially be shipped was Mulder and Scully from the original X-Files television series. However, upon further investigation, I also found a lot of references to a certain bromance – Kirk and Spock – from Star Trek. Fans of this pairing would label the ship as Kirk/Spock, then eventually shortened it to K/S. Eventually the Star Trek community referred to these fans as simply “slashers” (2). After I thought about it awhile, I realized that there has always been an undertone of shipping in every fandom with which I’ve ever been involved, and the idea of romance in any era has always existed. Anyone remember Twilight? Team Jacob and Team Edward? Now, there’s a perfect example of media-driven shipping, designed to align our emotional preferences and sell merchandise. Yep, I fell for that one. (*points at self, while wearing Team Jacob t-shirt*). Many a fan-fic piece has been inspired by a shipped pairing, but one does not need to take pen in hand to imagine the possibilities that exist among characters. Everyone, no matter their walk of life, has an OTP (One True Paring) they would love to see evolve into reality (thanks goes to my teenage son for that last reference), and will defend that pairing until the proverbial cows come home. People are very passionate and protective of their favorite OTPs, sometimes to the point of obsession and potentially destructive social behaviors. Many battles rage endlessly online concerning which characters should be paired with whom at any given time (should Link be with Zelda, Midna or Malon?). Case in point: this video. Although a fun representation of the emotions and psychology involved with shipping, it does contain images that may be offensive to some viewers, especially minors. Viewer discretion advised. Enter the new era of Star Wars and The Force Awakens. Right away, fans started shipping their favorite relationships, and lovingly hashtagging the living daylights out of every single one of them. Go to any social media website, and you’ll see countless examples. Before you start perusing the online images, I must offer a bit of caution: the fan community’s imagination is boundless, and some of the fan art/fan fic are less-than-discreet! Some of these ships started because of one simple line in the movie (“…where’s my boyfriend?”). Others sprouted from a glance, a hug, an interpretation of a conversation, or a bitten bottom lip that launched thousands of ships (#smolder). I must say, I’ve been drawn into some of these parings myself; not just because of the fun of it, but also for the possibilities that (could/do/might) exist. Right now, I’m on a Reylo kick. Not necessarily that I ship them as a romantic couple, but I do like the idea that their pairing could help balance the light and dark sides of the Force. For me, this ship represents my desire to see Rey “save” Kylo Ren from himself, from Snoke, and the Dark Side, and to bring his true soul – Ben Solo – back to the light. I’m literally mesmerized by the idea that this paring could bring back that balance. For me, this is the image that sums it up. See if you can view it from my perspective (it’s also my current cell phone wallpaper). Do you have any favorite ships? Who would you consider your OTP in your world(s) of fandom? I would love to hear about them! (1)”Shipping.” Bulbapedia: The Community-Driven Pokemon Encyclopedia. 22 July 2105. Web. 17 Mar. 2016. <http://bulbapedia.bulbagarden.net/wiki/Shipping>. (2) Schulmiller, Eric. “‘Shipping’ and the Enduring Appeal of Rooting for Love.” The Atlantic, 27 Dec. 2014. Web. 17 Mar. 2016. <http://www.theatlantic.com/entertainment/archive/2014/12/shipping-and-the-enduring-appeal-of-rooting-for-love/383954/>. Actually, there are a lot of instances in which the fandom drives canon – when a relationship is adopted into the canon realm, simply because the “powers that be” in a particular fan genre see the benefit of pursuing something the fans want to see! I wanted to talk about that in my piece here, as well as a few other points, but it would’ve made the entry too long!! Of course, not every ship sails, but many do…! 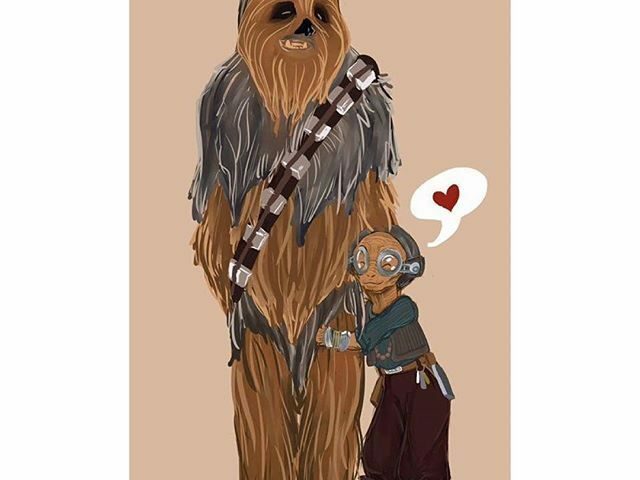 It will be interesting to see if any of these Star Wars relationships become canon at some point! Whoa! I had never heard of this before! I’ve been doing it my whole life–pairing people in my mind whether in fantasy or fiction, but my mind is kind of blown that it has its own word. I know exactly what you mean. It’s certainly human nature to root for romance, and the idea is historically nothing new, but now we have a name for it! After seeing your #Kanera tweet, I found out that, that hashtag really is a “thing”! …as is #Obitine: Obi-Wan and Satine, and #Vossajj (which, personally I LOVE)! It’s just a lot of fun! Honestly, I find this all kinds of creepy and disturbing. It certainly is not canonical in any way, shape, or form. It implies there is no legitimate relationship without romance. Yikes.